Among all the monkeys Gorillas have an attractive and muscular body much like that of human bodybuilders. Due to their muscular and well built body, we often wonder How Strong Is A Gorilla or how much is Gorilla Strength when compared to human. Here we have gathered complete information about the Gorilla Strength. You are going to learn the strength of male gorilla, female gorilla, silverback gorilla, lowland gorilla, eastern gorilla, mountain gorilla and baby gorilla. In addition to this you are also going to know the gorilla strength test, strength of their punch, how much weight they can lift and why are they so much strong. Furthermore, we have also compared the strength of gorilla with human. It’s not easy to say how strong gorilla is, because it does not show their strength often due to their gentle nature. However as per recorded experiments, an adult gorilla is four to nine times stronger than a average human. All gorillas can easily bend an iron bar and tear down banana trees. Gorillas are calm and nonaggressive by nature unless they are threatened or disturbed. Measurement of Gorilla strength is not an easy job. As per estimates made from several experiments, the Gorilla is around four to ten times stronger than an average human. With this strength all gorillas can break down and tear banana trees with their hands. Gorillas have even escaped from cages by bending the iron bars. The male gorillas are larger in size than the female gorillas and weighs almost double than the females. Due to this difference in size and weight, the male gorilla is almost twice as strong as the female gorilla. The average weight of silverback gorilla is 270 kg (600 lb) capable to reach a weight of 275kg (606 lb). When compared to an average human being, the silverback gorilla is four to nine times stronger than an average man. Silverback gorilla can lift a weight up to 815kg (1800 lb) while a well trained human can lift weight up to 410 kg. Silverback gorillas exhibits incredible strength when they break bamboo canes, almost 20 times stronger than that of the average human. First they bite the bamboo, which weakens it and then break it by hands. 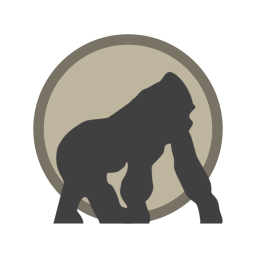 When compared to other Gorilla Species, the Western Lowland Gorilla is the smallest subspecies. Even though it is small in size than other Gorilla species yet it is a large primate and exhibits sheer amount of strength. The Western Lowland Gorilla is nearly as strong as the other gorilla species and the difference in strength might exists only due to difference in size and weight. The weight of fully grown male eastern gorilla is 140 to 205 kg i.e. 309 to 453 lb while that of female gorillas is 90 to 100 kg i.e. 200 to 220 lb. The Eastern Gorilla is a little more stronger than the Western Lowland Gorilla. Mountain gorillas are little bit larger in size than other gorillas species. An adult male has a weight of 195 kg (430 lb) while that of female is 100 kg (200 lb). Among all the Gorilla species, the Mountain Gorillas are slightly more stronger due to their size and weight. It is so powerful that it can even crush a crocodile. The weight of newly born baby gorilla is about 2.5 kg (4.5 lbs). The baby gorillas are weak and vulnerable as that of human babies. However, they are strong enough to cling to their mother body with a powerful grip using both their hands and feet. This keeps them stick to their mother even when the mother is moving fast. Baby Gorillas like to play with their elders or other young gorillas. They wrestle, tumble, climb trees, and even form a chain and walk through the forest. According to the Guinness Book of World Records, a silverback gorilla can lift up to 815 kg (1800 lb). On the other hand, a well trained human weightlifter can lift weight up to 410 kg (900 lb) which is half to what a Gorilla can lift. A Gorilla strength test was conducted in 1924, which showed that an adult gorilla can throw a 450 kg (900 lb) of force. While an average human can throw 100 kg (220 lb) which is five times less than that of a gorilla. Gorillas are 4 to 9 times stronger than human. Assume that the punch strength of a Gorilla and human has the same ratio. The average punch force of karate black belt is recorded at 325 pounds. So the punch force of a gorilla could be from 1300 lbs to 2700 lbs. Gorillas have stronger arms than their legs. It is due to presence of large muscles in their arms than those of their legs while in humans it is the opposite. Their arms are strong because they use it for bending and gathering foliage. It also helps them in self defense. Gorillas are capable of walking upright like us on two feet but due to their strong arms, they most often move as a quadruped i.e. on four limbs as it is much easier for them. When compared to their legs, the Gorilla’s arms are longer. Their arm span is about 1 feet i.e. 30 cm which is much longer than that of an average adult human. Gorilla jaw strength is extraordinary which makes their bite very powerful. They have 32 teeth like humans. The bite strength of a gorilla is about 1300 pounds per square inch (PSI) which is much higher than that of a great white shark (525 PSI) and lion (650 PSI). Gorillas are strong due to their large muscles and vegetarian diet. very large bumps and protrusions attached with muscles to withstand high stress. So gorilla are built strong by nature. As per Guinness Book of World Records a silverback gorilla can lift up to 815 kg (800 lb ) with its hands. A upper body strength of a gorilla is six times more than an adult human. Let’s say an average person can bench press his own body weight then a 300 pounds gorilla can bench press up to approximately 1800 pounds. Compared to humans the upper body of gorillas is well built as gorillas use their arms for both walking and climbing. Generally gorillas are 4 to 10 times stronger than an average human being. A silverback gorilla lift up to 815 kg (1800 lb) while a well trained human can lift a maximum weight up to 410 kg (900 lb). An adult gorilla can throw with almost 450 kg (900 lb) of force while for human it is 100kg (220 lb). the vertebral column of human is S-shaped while that of gorilla is bow shaped. Human legs are longer than human arms while in case of gorillas arms are longer than their feet. humans 5 toes are all aligned with each other while gorilla have opposable large toes. Size of rib cage in gorilla is much larger than humans. Gorillas arms muscles are larger compared to human arm muscles. An adult gorilla is four to nine times stronger than a average human. All gorillas can easily tear down a banana trees and bend the iron bar of a cage. The strength gorilla bite is 1300 (PSI). Silverback gorilla can lift upto 815 kg (1800 lb) of dead weight. The muscles of gorilla arms are larger in size than those in their legs.